This has to be the most hip album since “Low Ridin’” was first invented in the 50’s hydraulics and all. The fact that it has a Latin tinge adds to the mystique. Although this album is completely different from the five other albums made by Chris Washburne and The Syotos Band over two decades of its existence, it still is, to my mind, the finest volumes of the lot. The most immediate reason for this not-so-unexpected belief is the uncommonly articulate playing of The Syotos Band; the performance, for instance, of “Low Rider” an iconic song by War evinces a glowing dedication to the band and the low ridin’ movement, hydraulics included. The luminosity of texture, songful rapture and emotional clout—no matter how sardonic—mark it out as perhaps the most irresistible tracks on the album. The recording undoubtedly gets its immediacy and nose for atmosphere from the notional leader, the spontaneously combustive trombonist who does not play so much as burn through the songs he has no doubt arranged. 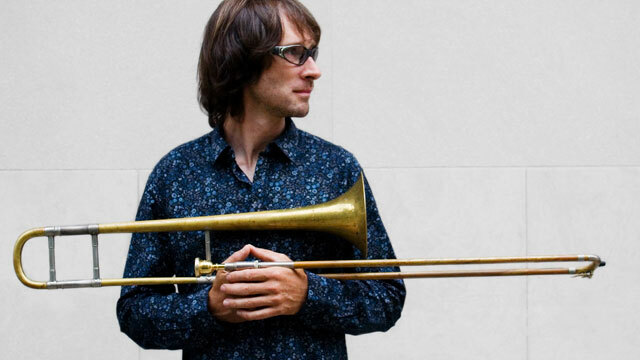 Mr. Chris Washburne might doff his proverbial hat to the “blue” trombone of JJ Johnson, but he is his own man and full of surprises here: freewheeling on Bob Marley’s “Get Up, Stand Up”, searing and intense on “Stairway to Heaven” a mash-up between the Led Zeppelin classic and Duke Ellington’s “Heaven” from The Second Sacred Concert (1968) featuring Alice Babs. But so are the other players in The Syotos Band. Trumpeter John Walsh certainly turns on the heat every time he plays as does the saxophonist Ole Mathisen, who also contributes the whimsical composition “Syotomon” that ends the album. Before this towering climax, however, there is plenty of room for swing and swagger. Two intriguing songs by Neil Young, the first being “Ohio” recalls with giddying eloquence the events that marked the Kent State shootings of 1970 when state troopers were called out to quell an anti-Vietnam War riot on that broke out on the campus; the second is “Sugar Mountain” a wistful recollection of Neil Young’s Winnipeg, Manitoba. The Syotos Band turns these songs into brilliantly elegiac music that might bring a lump to the throat if you grew up in Canada or were associated with the Anti-war protests of the late 60’s, or, quite simply a follower of the music of Crosby, Still, Nash and Young. At any rate, this music has been turned into something with piercing organic power just as the other songs on the album, especially Jimi Hendrix’s “Manic Depression” and Lou Reed and the Velvet Underground’s “Walk On The Wild Side”, both of which are purely magical. Another rewarding aspect of Syotos records are their notes. If you were a baby boomer with an elephant’s memory then you might not need them, but I suspect that Chris Washburne and The Syotos Band has built up a large following of new listeners, a repository of soul searchers who will not only find these notes informative and exciting, but a leaping point back into the 60’s and 70’s though not in a moldy fig sort of way, but in the manner of a voyage of discovery under the auspices of the spectacular music of this disc. 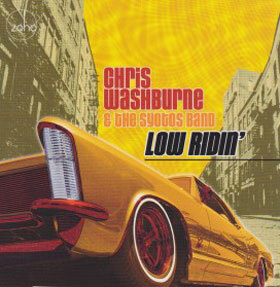 Chris Washburne and The Syotos Band invite you on a journey that is meant to be a rite of passage for anyone interested in learning about what it meant to be hip back then… and now again, with Low Ridin’. Track List: Feelin’ Alright; Low Rider; Get Up, Stand Up; Stairway to Heaven/Heaven; Manic Depression; Ohio; Walk On The Wild Side; Break On Through (To The Other Side); Kashmir; Sugar Mountain; Syotomon. Personnel: Chris Washburne: trombone and tuba; John Walsh: trumpet and tuba; Ole Mathisen: saxophones; Yeissonn Villamar: piano and keyboards; Leo Traversa: bass; Vince Cherico: drums and percussion; Oreste Abrantes: percussion; Roberto Quintero: percussion; Isa Washburne: percussion; August Washburne: electric guitar.